Tecserv site surveys are carried out by an experienced member of the Tecserv field team, the surveyor will walk through the route the photocopier will take to its final location and will measure any stairs, landings and doorways that may be of concern therefore ensuring a smooth installation, collection or relocation of the device in question. If we do encounter any restrictions or points of concern during the survey we will attempt to find an alternative option to get the machine to its new location, we often use a four-man team who will manually lift equipment up stairways with tight landings where a stair walker cannot be used and in extreme situations we have been known to use Hiab loaders and full size cranes to install devices over walls, through windows or via rooftop terraces. Whatever the case we will try our very best to ensure the device can be delivered to its new location with minimal disruption to your customer, for more information with regards to the free site survey service please do not hesitate to contact the booking team. 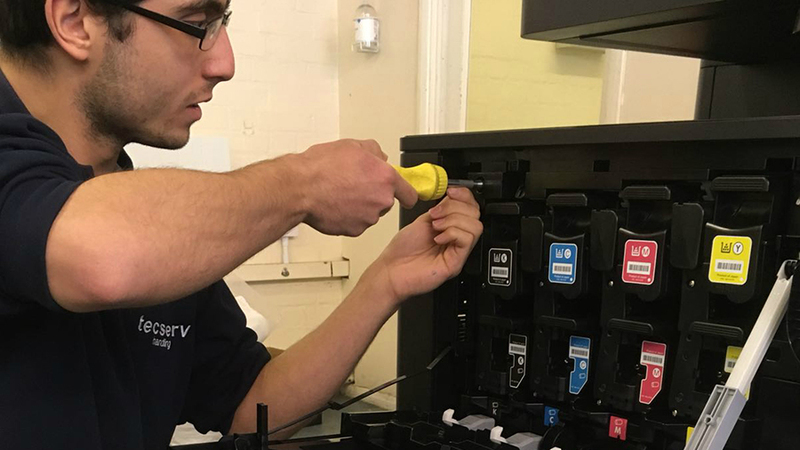 Tecserv have a dedicated workshop team who are fully trained and capable of setting up any make or model photocopier to your requested specification and even go as far as applying your company service sticker and desired reference number on the machine prior to installation. 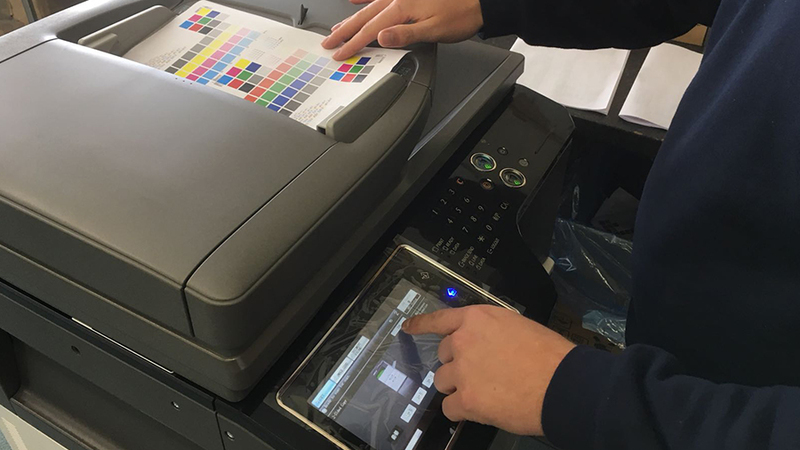 Also known as a PDI service Tecserv's photocopier preparation service helps reduce our clients lead time to market as it basically removes the need for Tecserv to attend your premises to collect the device prior to installation. After listening to client feedback, we have found that customers who use the PDI service have a significantly improved engineer efficiency rate, this enables their service engineers to be more effective in the field as they can complete a higher percentage of service calls throughout the day therefore contributing to maintaining consistently high customer satisfaction levels. There is no need to worry about the inbound delivery notes as the paperwork for equipment received is scanned into our system and is accessible through our online booking system which allows you maintain control while keeping your records up to date. For more information with regards to having a photocopier set up in our workshop please do not hesitate to contact us. 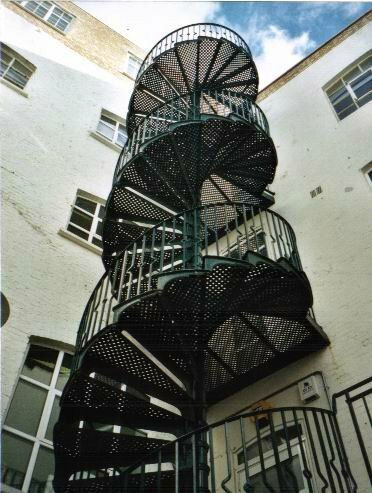 Tecserv offer connectivity services alongside our installation work. 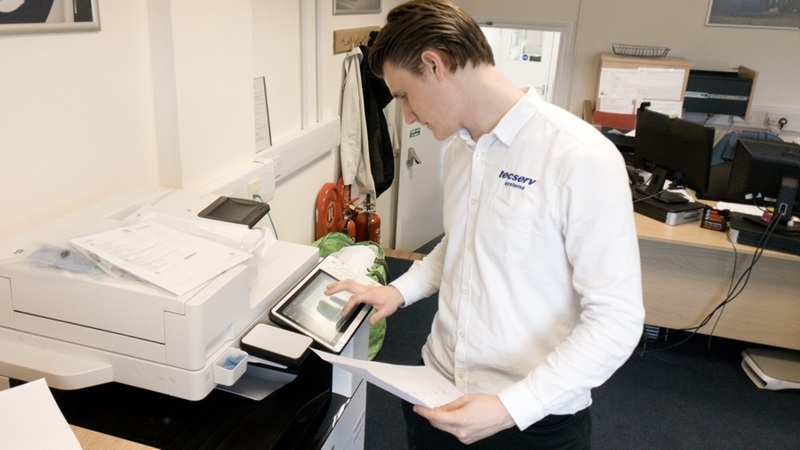 Our skilled technicians are able to integrate photocopiers & printers into most commercial environments. You will no longer need to worry about customer downtime as we replace their existing photocopier - we can ensure the new device fits into the network and allows staff to continue printing with minimal impact on their day. This means you will no longer need to make special arrangements for an engineer to meet our installation team on the day of install in order to keep the customer online. We can handle small business setups, all the way up to huge offices with Windows Servers, many desktops & scanning functionality. Due to our extensive experience in the photocopier installation market Tecserv can handle any make and model of photocopier meaning our technicians can install anything from the smallest desktop multifunctional devices to the largest high quality print room machines providing our customers with a bespoke installation service rivaled by no other. 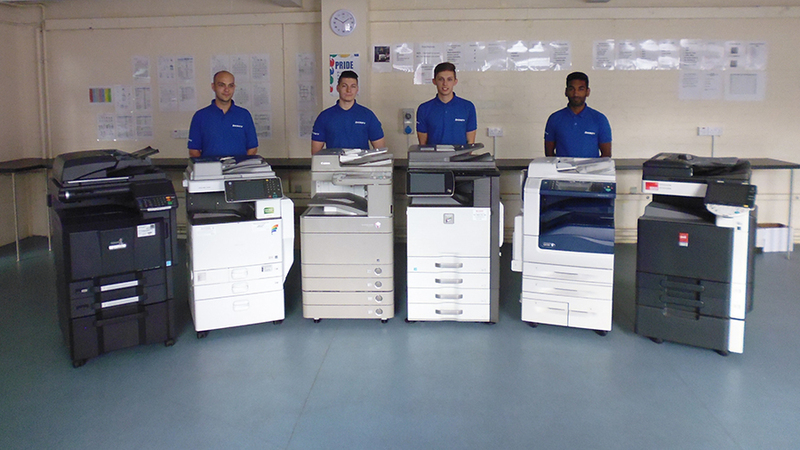 Tecserv's installation service is to the point of use rather than simply just delivering a photocopier to a chosen address therefore when a Tecserv technician is completing an installation they will go the extra mile, powering up the device and providing the customer with 'Green button' hand over training. Green button hand over training is where the installation technicians would show the customer how to switch the copier on and off, load paper/toner, produce a basic copy as well as clear common paper jams leaving the client confident in operating the new device without the need for additional training. 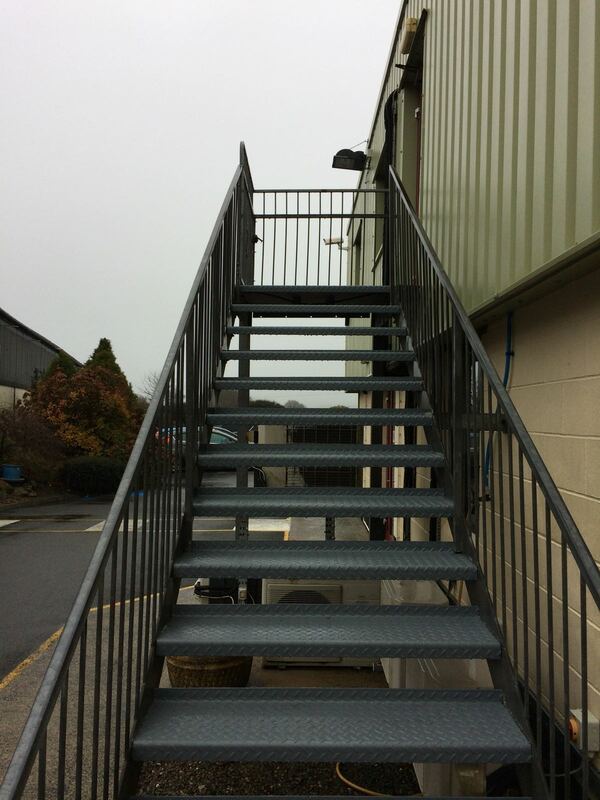 Our installation crews are considered to be experts in delivering reprographic equipment to extremely awkward sites and over the years have become devoted to delivering the highest level of service even when faced with the most challenging of tasks. 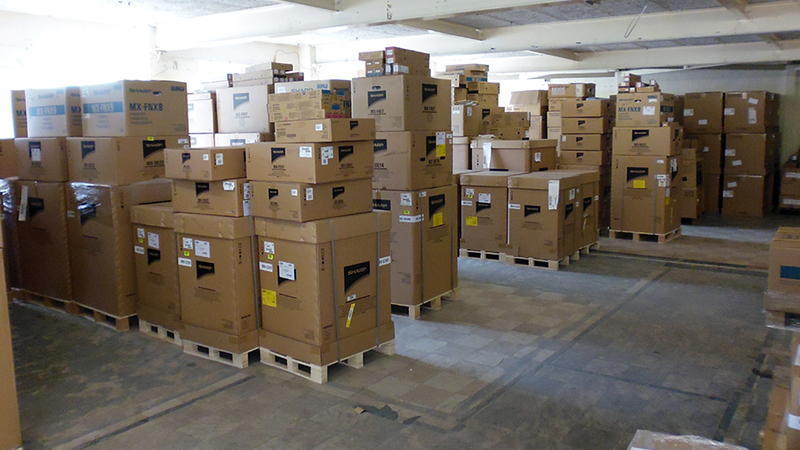 For more information regarding the delivery of a copier please do not hesitate to contact us. 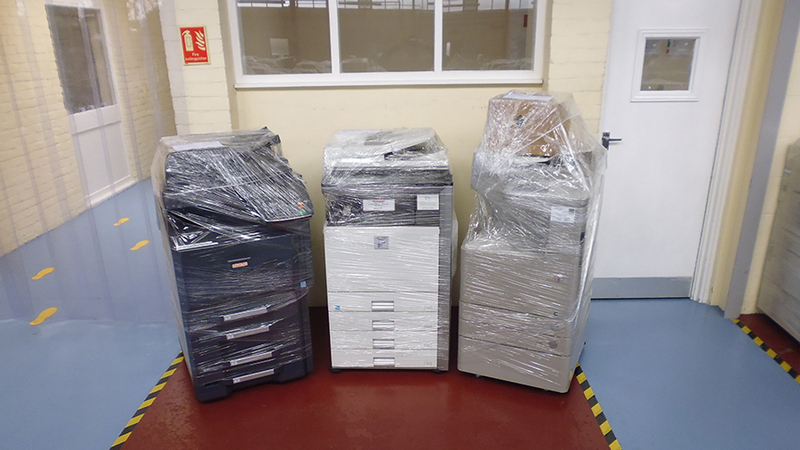 Tecserv offer a complete photocopier collection service whether it's for storage, relocation, exchange or disposal one of our highly trained teams will arrive onsite, decommission the device, wrap the machine in a protective film eliminating the chance of the copier coming into contact with moisture and dust during the collection, storage and transportation process. To ensure the machine is easily identifiable once it reaches our dedicated warehouse the device will be clearly labelled with a sticker listing the machine details i.e. make, model, accessories, customer name, removal date as well as meter readings at the time of collection and will be added to your individual storage account which is accessible through our customer portal "System Dynamo". When collecting photocopiers from your clients premises Tecserv will apply the same expertise and professionalism as if we were installing a new machine, our aim is to complete the process in a timely fashion with minimal disruption to the customers office. For more information with regards to the collection of your photocopier please do not hesitate to contact us. Tecserv offer a complete photocopier relocation package, whether you need to move a photocopier from one location to another within the same building or you are moving a copier from one site to another you can trust Tecserv to get the job done safely and efficiently. Our experienced technicians will dismantle the photocopier in its current location and proceed to wrap the device in a protective film to safeguard the device from moisture and dust throughout the relocation process. The machine will then be removed from site where it will be loaded on to one of our 3.5 tonne Luton vehicles via a 750kg tail lift and strapped into our specially designed load lock system ensuring the device is kept safe throughout the transportation process. Once the photocopier arrives at the new premises Tecserv will remove the machine from the vehicle and install it to its new location where the fully trained technicians will reassemble the device and power it up ready for use. For more information with regards to having your photocopier moved please do not hesitate to contact us. Tecserv currently offers 15,000 square feet of secure, temperature-controlled warehousing, our premises are monitored by a state of the art security system so machines awaiting preparation and installation can be stored at our locations with complete confidence. Tecserv also have the ability to store used machines where Tecserv's stock control systems will allow users to view and request copies of information in an excel format providing you with all the relevant details you may need about machines you may have in storage with us. The above service is offered as a standard used storage bundle consisting of a daily charge for the storage of the photocopier including any accessories. 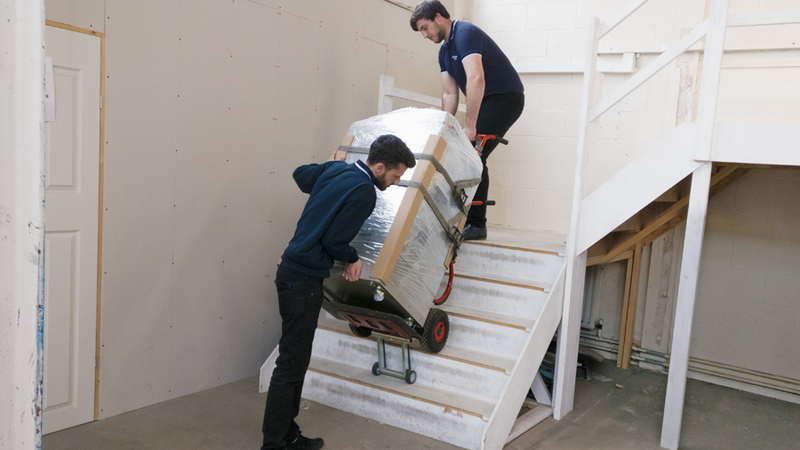 We offer a month's free storage from the date of collection, allowing you time to make a decision about what to do with your machine, whether you would like it returned to your warehouse or delivered elsewhere, we are able to cater for all requests. For more information with regards to having your copier collected and stored with us please do not hesitate to contact us. The WEEE (Waste Electrical and Electronic Equipment) Directive affects everyone involved in the manufacture, selling and distribution, recycling or treating of any electronic equipment. Included in the directive are household appliances, information technology equipment of all kinds, telecommunications equipment, audio visual gear, lighting equipment, electronic tools, hospital and medical devices and automatic dispensers and of course, office equipment including photocopiers. The aim of the WEEE Directive is to reduce the waste generated from electrical and electronic equipment. It is also designed to encourage best practice in recycling and ensure an improvement in the environmental procedures and processes of all those involved in the life cycle of electrical and electronic products. Manufacturers, sellers and distributors of office equipment are responsible for taking back and recycling electrical and electronic equipment. 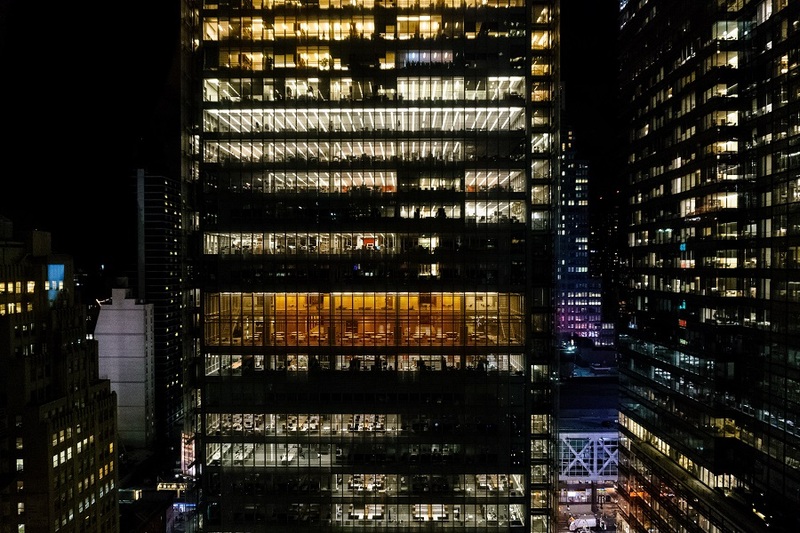 However, the cost of maintaining compliance can be high, and many businesses prefer to outsource the disposal process to others with the capability and resources to ensure compliance on their behalf. 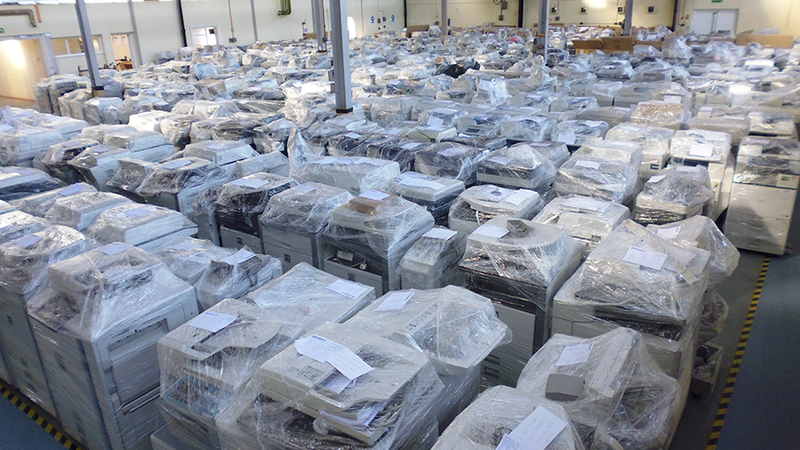 Tecserv have been offering its customers a safe and compliant disposal service for obsolete office equipment within statutory and regulatory guidelines since the directive was first introduced. For more information regarding the WEEE Directive and disposal of electronic waste please click on the following link: www.environment-agency.gov.uk/weee. 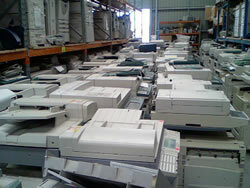 For more information with regards to the collection of your copier please do not hesitate to contact us. 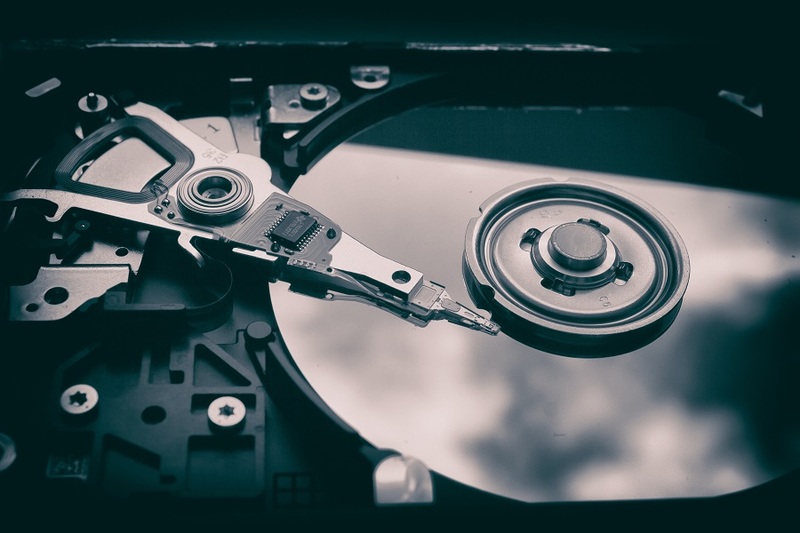 Tecserv offer hard drive removal and erasure services alongside our collection work. Our skilled workshop technicians are able to locate and remove hard drives from photocopiers, we then give you the option to wipe the hard drive prior to sending the hard drive back to you. This means you will no longer need to make special arrangements for an engineer to meet our collection team on the day of collection in order to wipe the data from the hard drive. Tecserv offer timed and out of hour services which supplements our wide range of services. 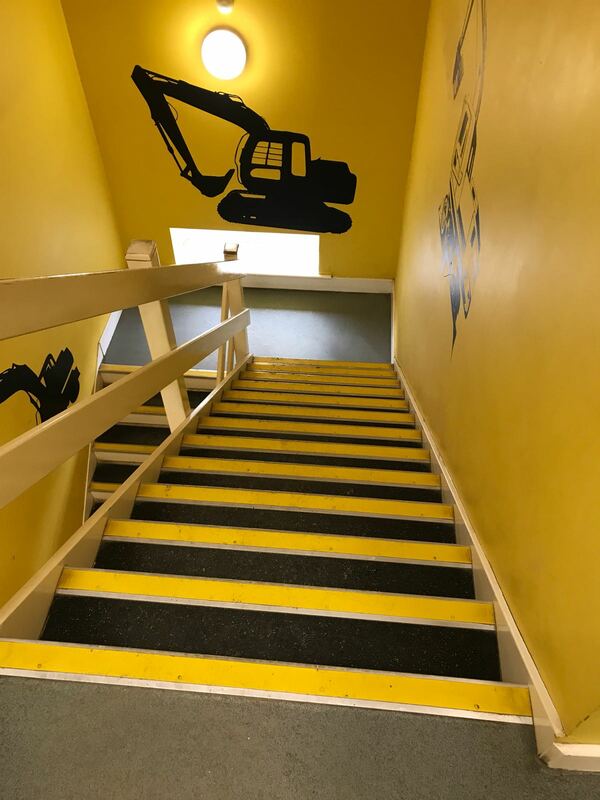 Our skilled technicians are able to provide and fulfil services within a specified time frame and even provide out of hours services for your convenience. This means you will no longer need to worry about any down time interfering with your hours of operation. Providing this service after office hours, for example, enables our teams to move efficiently through an office, upgrading the printing equipment, all without disturbing company productivity.